The post PayCoin Price Plunges to Ring in the New Year appeared first on CryptoCoinsNews. The post Coinprofit.io – A New Way to Earn Bitcoin appeared first on CryptoCoinsNews. In the spirit of making resolutions for the new year, members of the bitcoin community should look at 2015 with a fresh perspective. Breaking my normal rule of discussing equity prices let me say only that the S&P 500 index of Wall Street stocks will not defy monetary gravity or the feedback loops of global stress for much longer. Half the earnings of US big-cap companies come from overseas, repatriated into a stronger dollar, and therefore worth less in reporting terms. The index has risen at double-digit rates for three years, further inflated this year by companies buying back their own shares at a pace of $130bn a quarter, often with borrowed money. The profit share of GDP is at a post-war high of 12.5pc (much like 1929), an untenable level as US wages start to rise and the balance of power swings back to labour. 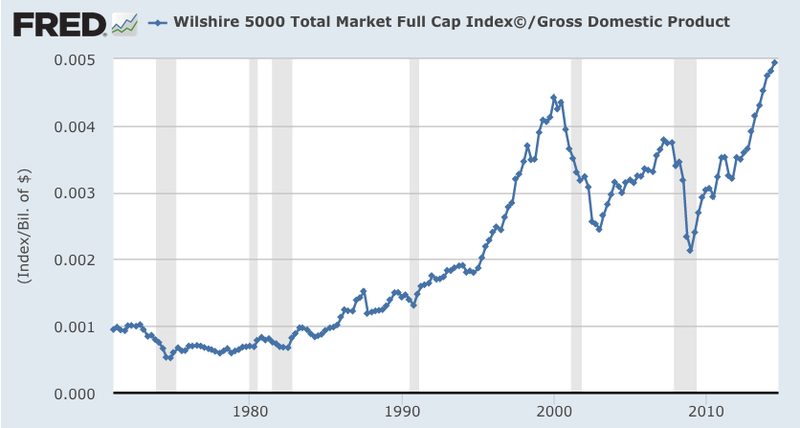 The S&P index measuring the price-to-sales ratio is higher today than at its pre-Lehman peak. Expect a shake-out of 20pc comparable to the LTCM crisis in 1998 when the wheels came off in Russia and East Asia, though don’t be shocked by worse. Emerging markets are a much bigger part of the world economy today, and their combined debt ratio is a record 175pc of GDP. In case Mr. Evans-Pritchard's logic has dented your confidence that 2015 will be another great year — and in case you want to restore your full bullishness — here's Jeremy Siegel predicting that the Dow is headed to 2000. The post Bitcoin Price Noodles Down appeared first on CryptoCoinsNews. The post Will Bitcoin Collapse in 2015? – Financial Times appeared first on CryptoCoinsNews. The disappearance of 650,000 BTC from Mt Gox was due to internal system irregularities and not an external attack, reports a Japanese newspaper. The post Japanese Police Suspect 99% of Mt. Gox Bitcoins Missing Due to Fraud, Not Transaction Malleability Hack appeared first on CryptoCoinsNews.